Present documents and certificates with style. Traditional style with silver accent lines. Protective glass front. 8 1/2 x 11 has a two-way easel back and hangers for desktop or wall display; 11 x 14 for wall display. Includes a usable certificate. Vertical or horizontal display. Drop in black back. Traditional and classic black document with silver accent lines. 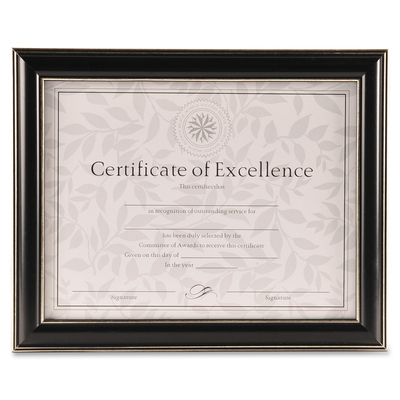 Perfect enhancement for any award or certificate. 8 1/2 x 11 includes a two way-easel back with hangers for desktop or wall display; 11 x 14 has hangers for wall display and is double matted (off-white over black mats). Usable certificate included. Can display vertically or horizontally.